Background: The prolonged circulation time of nanoparticles in the blood is a prerequisite to realize a controlled and targeted (passive or active targeting) release of the encapsulated gene/drug at the desired site of action. The most popular method to mask or camouflage nanoparticles is the adsorbed, grafted or conjugated of poly (ethylene glycol) (PEG) or other hydrophilic polymers (e.g. polysaccharides) to the particle surface. However, the circulation half-life of nanoparticles still cannot satisfy the need of clinical use. 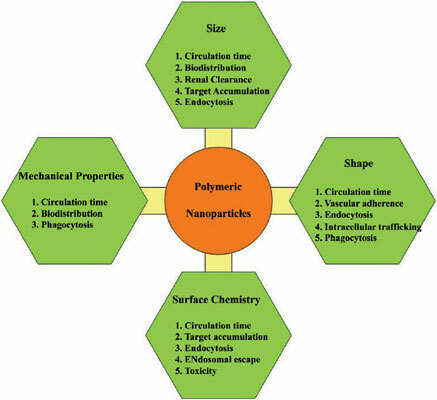 Method: This review focuses on several recent advances in the design and fabrication of polymeric nanoparticles with long circulating characters in blood. The factors influencing the physicochemical characteristics of nanoparticle surface and its surface modification have been discussed. Results: Gene/drug carriers can also be combined with functionalized physical, chemical or biological stimuli to improve passive and active targeting strategies. The choice of suitable manufacturing technique of polymeric nanoparticles depends on the gene/drug to be encapsulated in the particle, the physicochemical properties of the polymer, their therapeutic goal to be reached and the scalability of the fabrication which allows for a clinical realization of the most promising nanomedicines. The factors influencing long circulating properties of nanoparticles are mainly particle size, surface charge and hydrophilicity. Surface modification of polymeric nanoparticles has been focused on PEG, polysaccharides, and so on. Conclusion: Identification of novel potential coating materials with satisfied characters is an emerging field of interest in the design of long circulating polymer-based nanoparticulate gene/drug delivery. Keywords: Long circulation, biodistribution, opsonization, mononuclear phagocyte system, polymeric nanoparticles, gene/drug delivery. Keywords:Long circulation, biodistribution, opsonization, mononuclear phagocyte system, polymeric nanoparticles, gene/drug delivery. Abstract:Background: The prolonged circulation time of nanoparticles in the blood is a prerequisite to realize a controlled and targeted (passive or active targeting) release of the encapsulated gene/drug at the desired site of action. The most popular method to mask or camouflage nanoparticles is the adsorbed, grafted or conjugated of poly (ethylene glycol) (PEG) or other hydrophilic polymers (e.g. polysaccharides) to the particle surface. However, the circulation half-life of nanoparticles still cannot satisfy the need of clinical use.